Candy has a long history as a familiar food treat that is available in many varieties. Candy varieties are influenced by the size of the sugar crystals, aeration, sugar concentrations, color and the types of sugar used. Jelly candies, such as gumdrops and gummies, use stabilizers including starch, pectin or gelatin. Simple sugar or sucrose is turned into candy by dissolving it in water, concentrating this solution through cooking and allowing the mass either to form a mutable solid or to recrystallize.Other sugars, sugar substitutes, and corn syrup are also used. Another type of candy is cotton candy, which is made from spun sugar. So, enjoy your treat — in moderation, of course — and check out the ways candy can improve your health. Rich, dark chocolate is packed with powerful heart-healthy antioxidant flavonoids. While an occasional candy bar can be part of an otherwise healthy diet, eating candy regularly can negatively affect your health. Too much candy can provide you with large amounts of unhealthy substances, such as sugars and fats. Given that candy in all its various forms is mainly composed of processed sugar, you can expect the same health risks that result from the over-consumption of highly refined sucrose. 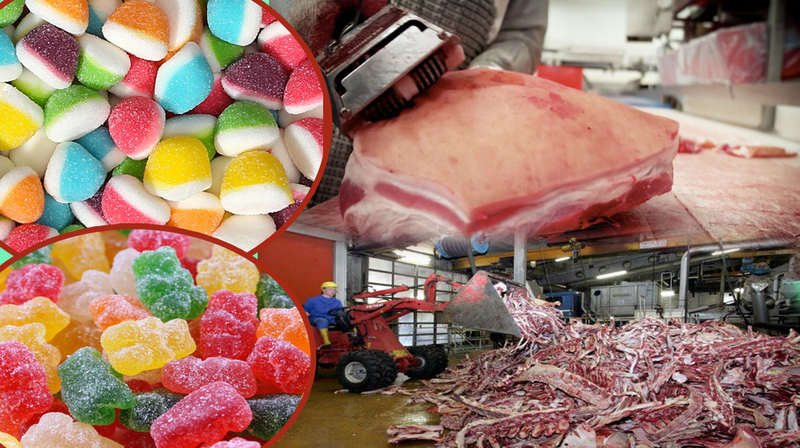 There are other ingredients that go into the manufacture of commercial sweets and unfortunately these also present potential problems. Gelatin is a yellowish, odorless, and nearly tasteless substance that is made by prolonged boiling of skin, cartilage, and bones from animals. It’s made primarily from the stuff meat industries have left over — we’re talking about pork skins, horns, and cattle bones. Ugh. Gelatin is derived from pork or cows, but a candy that includes gelatin as an ingredient does not necessarily contain pork or beef. Some kosher gelatins are manufactured from fish. The ingredients list should indicate which type of gelatin was used during the manufacturing process. If it doesn’t, it may be necessary to contact the company directly to obtain this information. The following short film by a Belgian filmmaker Alina Kneepkens will dramatically change the way you look at gummy candies.